What’s Christmas without a night out at the panto? This year, Sleeping Beauty is the enchanting, laugh-out-loud production for all the family at the Sunderland Empire. Round up the troops for an unforgettable evening of hilarious one-liners, show-stopping numbers and larger-than-life characters. Sleeping Beauty is the timeless story of Princess Briar Rose who has a spell cast over her by a wicked fairy – but can the spell be broken by true loves kiss? This spectacular pantomime packed with colourful costumes and sparkling sets will certainly add a touch of fairy dust to your festive season. Complete with creative comedy, fairy magic, panto puns, spellbinding special effects and a love that defeats all – you won’t want to miss out on this fabulous, festive fairytale. This year, a Steps star, two soap sensations, a silly Cbeebies host and an astonishing singing pianist make up the brilliantly bonkers cast. Star of stage and screen (as seen in Coronation Street and Les Misérables) Vicky Entwistle sees green in her role as the evil Carabosse. While Faye Tozer steps up her game as the sparkling fairy godmother. The perfect, party princess is played by the beautiful Amy-Leigh Hickman, who you might know from Tracy Beaker and EastEnders. And the warm, witty characters of Silly Billy and Nurse Nelly are played by children’s TV favourite, Andrew Agnew and legend of radio, screen and stage, Bobby Crush. A special mention goes out to the fighting fairies, who make the perfect panto pair. The fairy duo form the basis of the story, in a battle of good versus evil – and they do it oh-so well. The ultra-glam Faye Tozer, with her sweet, sweet voice and beautiful blonde hair, makes the perfect good fairy – while Vicky Entwistle masters the bad fairy role with her creepy cackles, wicked wit and dazzling, dark costume. 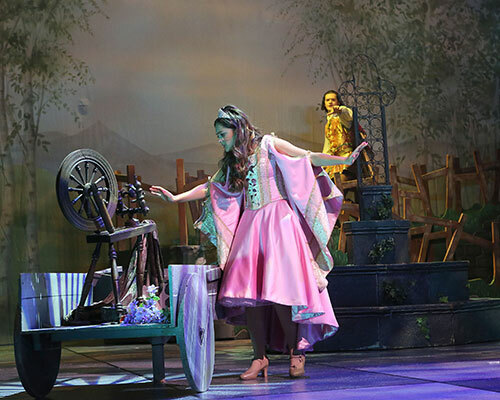 Princess Briar Rose and her handsome Prince Charming are a real hit – showcasing their good looks and their star-studded singing voices – perfecting that all important kiss and wowing the audience with their on-stage chemistry. But it’s Silly Billy and Nurse Nelly who really hold the show together – with their cheeky-lines, audience interaction and parent-pleasing jokes. Their energy is infectious and their one-liners are side-splittingly funny. The best-loved fairytale of good versus evil is delivered in a fabulously festive fashion. Expect fighting fairies, magnificent musical numbers, clever comedy scenes, the chance to get your little ones on stage and the all important romance. For the kids – there’s the telling tale of true love, combined with the silly scenes of Nurse Nelly and Billy. For the grown ups – there’s plenty of age-old jokes, special effects that will wow even the techiest of viewers and colourful costumes that will make you smile throughout. And there’s even something for the 90s kids out there – the Good Fairy (Faye Tozer’s) spectacular Steps montage is a definite highlight – bringing back memories of school discos and Brit-pop parties. In terms of the staging, costumes and overall production – it has to be the Sunderland Empire’s best yet. The cast, in all their glittering panto splendour, look dazzling from start to finish – if a costume doesn’t wow you with its sparkling beauty, it’s sure to make you chuckle. It’s a stunning, star-studded production and no expense has been spared. With not a single sole sitting as the red curtain comes down, it’s safe to say that, Sunderland Empire, you’ve perfected another panto masterpiece. It’s a show for the entire family – so round them up for a fun-filled evening of good old panto tradition. It’s an all-singing, all-dancing production that involves everyone from grandma to the little ones. Showing now, until December 31, 2016. Make sure you book up!